The Ester Isotropic Polyester Film Type "IT" is a bi-axially oriented polyester film primarily used for lidding applications. In the modern context, lidding plays an all-important role in not only protecting the product contents, but also in reinforcing the brand identity. The lid offers a product billboard that may be the most visible surface to the consumer, depending on how the product is displayed. 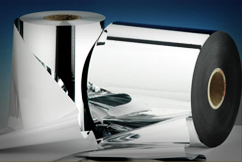 In a typical lidding structure, heat seal lacquer is applied on one side (non-metal side) of this film and the other side is laminated with the printed substrate. This film is available in various versions viz. corona treated, chemical coated and/or with metallization. It is available in the thickness of 12 & 23 micron.